This week, we are revisiting a photo which we featured once before, but from a different perspective. 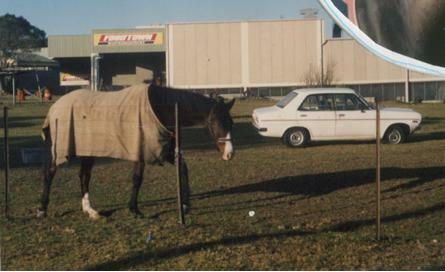 The image above was shared by Kylie Snell (nee Ellem), along with several others which focus on the so called ‘horse paddock’ and the horses who once resided there. Yet this photo is also our only image of IGA, as it once was, and indeed during the time when it was run by the Hourigan’s. I recall going shopping with my Mum 25 to 30 years ago, as a little girl. I would always be on my very best behaviour, not because Mum was watching, but because Mrs Hourigan was. If I behaved for Mum, Mrs Hourigan would appear with a small packet of chips as a reward. Sometimes I even got a lollipop if my behaviour was absolutely exemplary. With the fire which recently caused so much damage to the building, it is wonderful to see images of the building during its prime. Indeed, it is at times like these that we realise just how important images can be in recording our stories. We encourage you to share any images or memories you have with the Berowra Living History community.